Zack recently finished his last high school cross country season, his fourth and final season at Stockdale High School. For our family, this wraps up eight years of cross country at Stockdale since his brother Jake also ran all four years. It’s the end of an era! Usually, though, when you think “end of an era,” you think of a period when a certain athlete or family really dominated. Ya, that’s not how our family will be remembered, but that’s okay because our reality is something even more unique in my book. At the end of cross country season, Coach always takes a moment to talk about each runner, highlighting something unique about each boy. About Zack, Coach reminded the packed room that some runners are “competitive runners” and some are “lifestyle runners.” This brought soft laughter from the crowd of parents; obviously this wasn’t going to be a commentary on Zack’s running prowess. At 5’11” and 180 lbs, our boy is built more like a quarterback or a tight end than a runner. He’s not a “scoring” runner for our team. But he shows up, he gives it his all, and apparently he encourages others to do the same because Coach awarded him the Most Inspirational Runner Award. We were pretty proud. Our family’s running regimen started when Jake volunteered eight years ago to be my own personal trainer and to help me “become a runner.” I always wanted to be a real runner but all attempts had ended with me…not running. This time we started with evening walks, then Jake used his iPhone timer to get me to our first goal: running 30 seconds straight (really). And you know what? During a run, when Mom can’t talk because she’s sucking air, even a 13 year-old-boy’s guard comes down and he’ll start talking. A lot! I learned more about Jake during our evening runs than I ever knew before! Plus, he was encouraging and patient. I’d also call him successful because eventually he and I began a family tradition of running half marathons together (bringing Zack into it, too, as he got older). 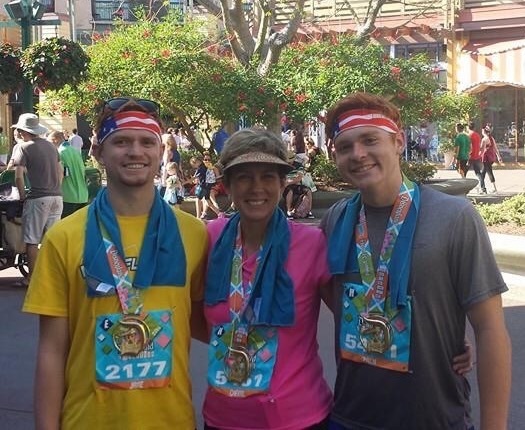 I’m lucky to say I have enjoyed running in more than 20 half marathons and countless other races with my boys, friends, neighbors, co-workers, cousins, and my 65 year-old Aunt Elaine (who I call the running matriarch of our family). There’s even been a 5k here and there with Darren. Most mornings at 5 a.m. you can find Sylvia, Anna and me out in the neighborhood, burning calories and gearing up mentally for the day ahead. Zack doesn’t necessarily love running, but it’s one of the tools in his toolbox to help him stay fit. Jake is on the Cal Poly triathlon team and he’s looking ahead to a career that will help others build a lifestyle of health and fitness, just like he has. I will never place first in a half marathon, or a foot race of any kind. Remember, it took me 40 years to run 30 seconds without stopping! But that’s okay. If they had a Lifestyle Runner medal, I’d wear it with pride. Every day. Hopefully for many years to come.